I've got a quick mid-week recipe today for you, using two of my favourite ingredients ~ quinoa and halloumi. Quinoa is gluten-free and super high in protein. I haven't yet seen it in a large supermarket, but you can pick it up in most health food stores. This is a great meal in itself or works well as a salad to share. Why not chuck the halloumi on the barbecue? 1. Put the quinoa in a pan and cover with water. Bring to the boil and simmer for about 20 minutes. 2. Put the spring onions and rocket into a large serving bowl. If, like me, you're not keen on raw spring onions, give them a quick dry fry first. 3. Cut the halloumi into chunks and grill in a griddle pan, turning over when browned. 4. Add the peas to the quinoa pan for the final 2 minutes of cooking. Drain and add to the serving bowl. 5. Add the lemon juice, olive oil and herbs to the bowl and mix. 6. 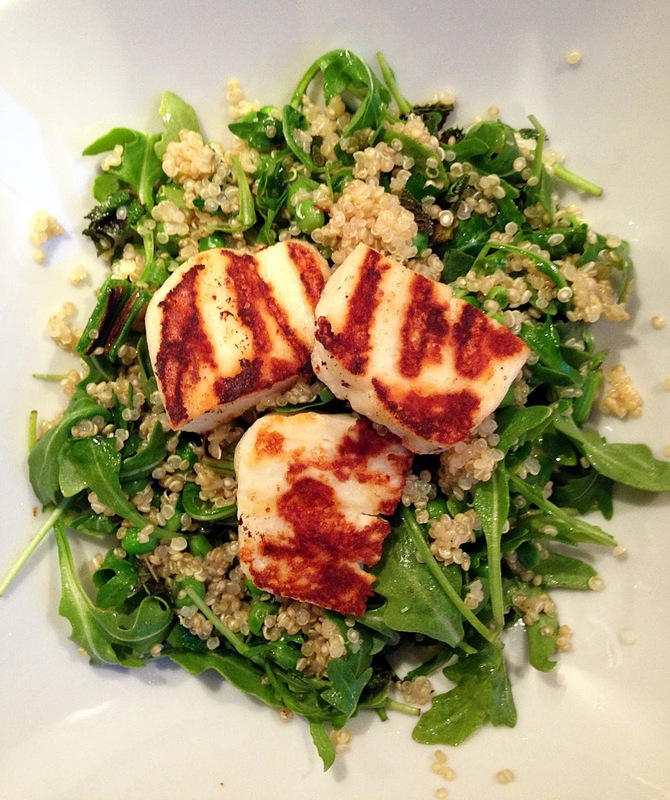 Plate up the quinoa mixture and artfully arrange slices of halloumi on the top before serving.